Take for example this great ad campaign for Zico coconut water which uses ocean views and witty copy to make pack shots of its product more fun and eye-catching. 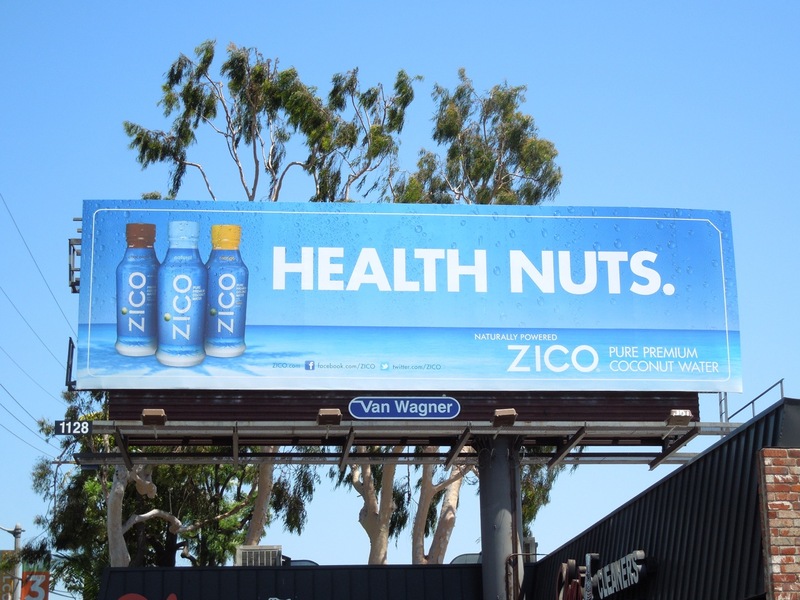 The palm frond shadow at the base of the pack shot is a nice device and the calm blue ocean really does reinforce the refreshing, hydration message too. 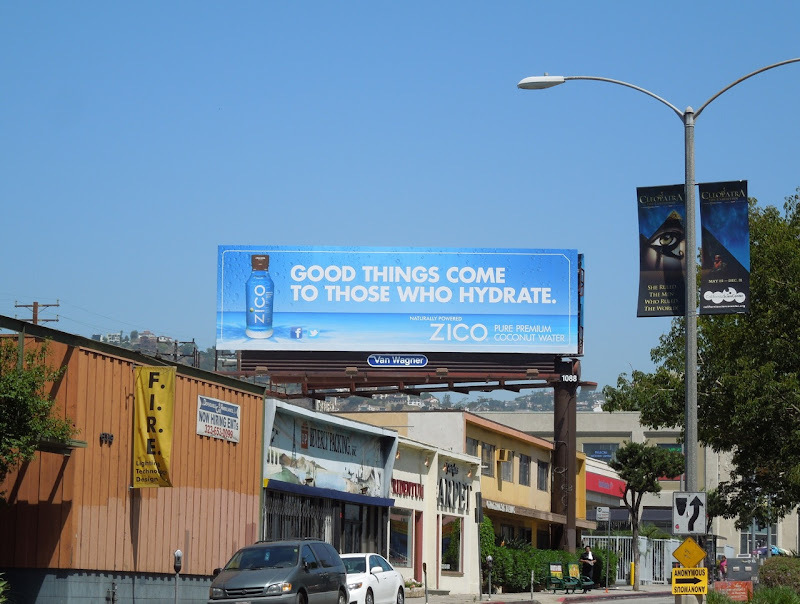 It's funny how when you put all of Zico's billboards together they form a sea of blue around the streets of L.A. which also helps illustrate the brand consistency of the ad campaign. One of Daily Billboard's favourite creatives from the campaign is the '72,000 palm trees in L.A. 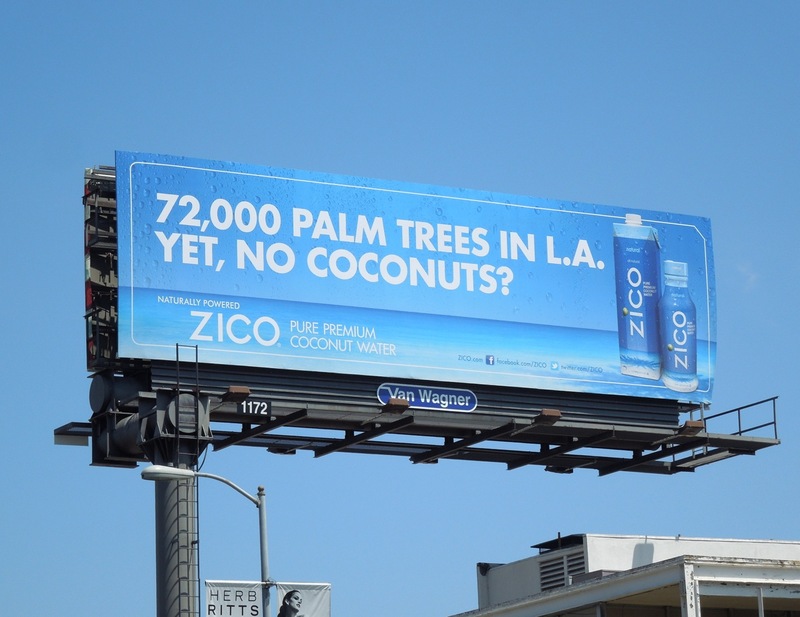 Yet, no coconuts?' 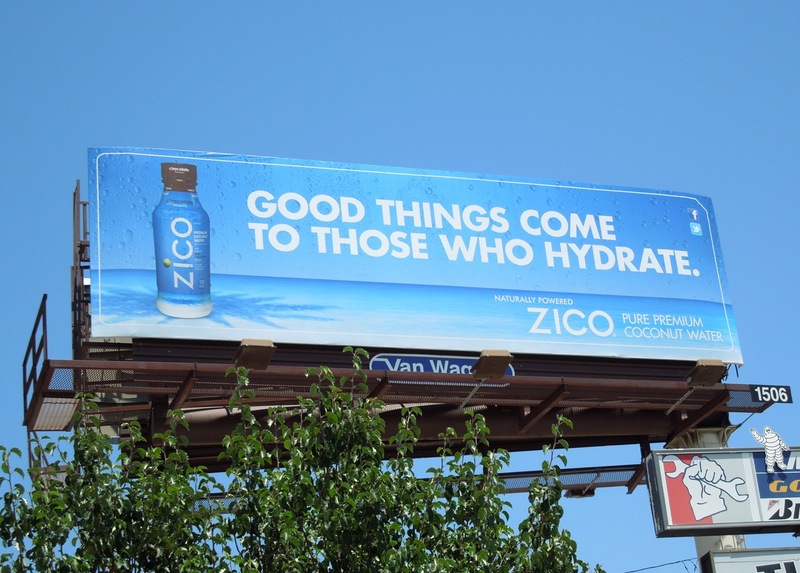 tagline. 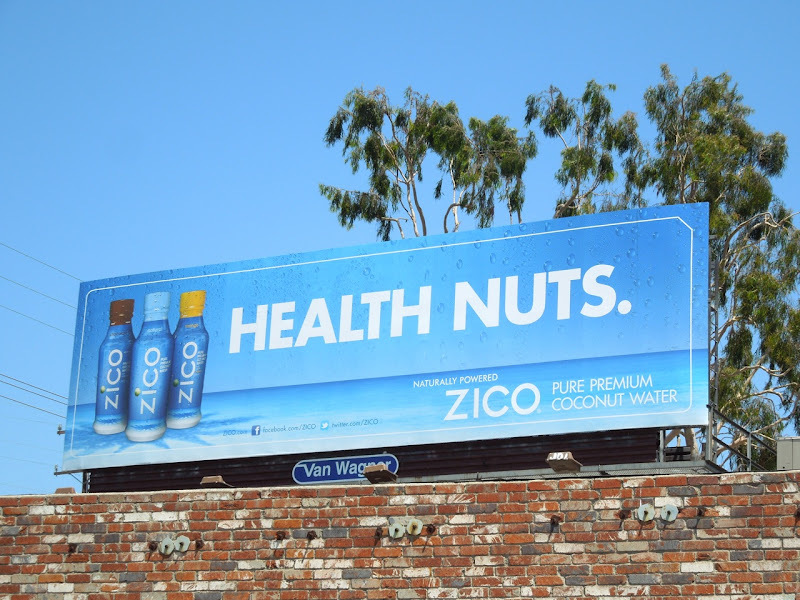 It's humorous and engaging, and it really does make you question why. 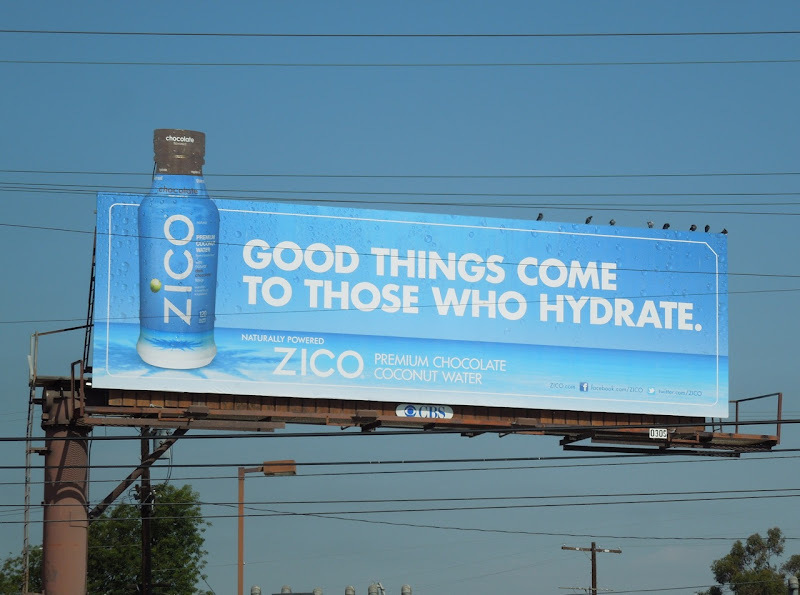 There's also nothing like a special extension billboard to attract extra attention (even in this case if it's a flock of birds). 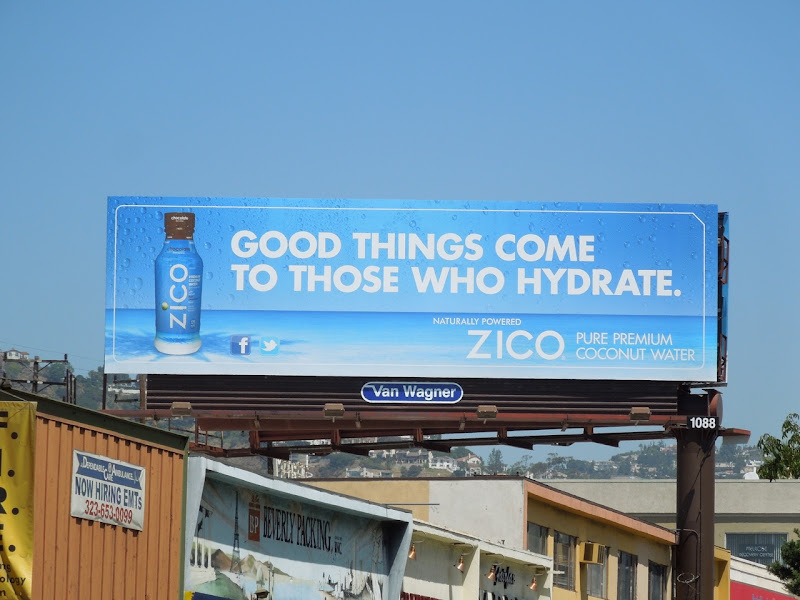 These Zico billboards were snapped around the streets of L.A. from mid-July through mid-August 2012, including along Sunset Boulevard, Fountain Avenue, 3rd Street, Fairfax Avenue and Venice Boulevard. 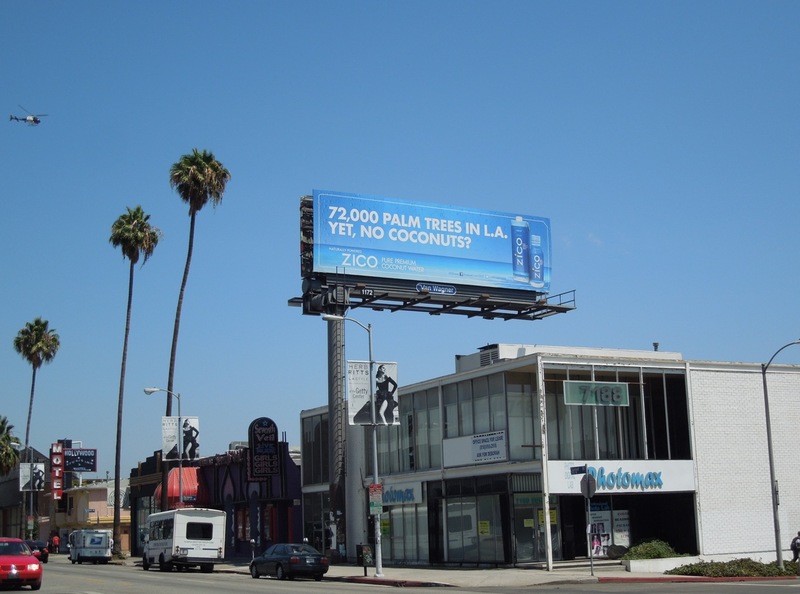 For another way to advertise coconut water by using celebrity endorsement, check out these Vita Coco billboards featuring Rihanna. 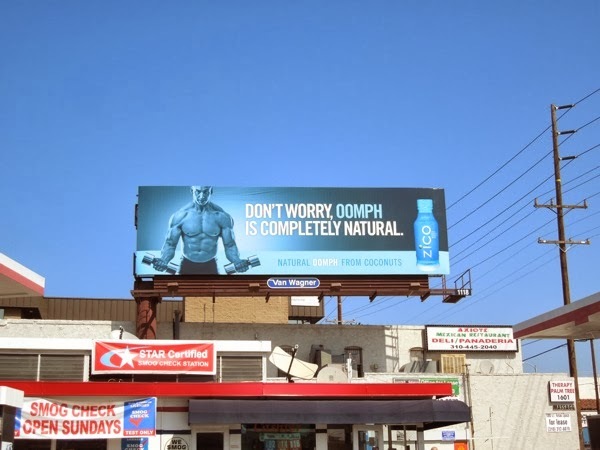 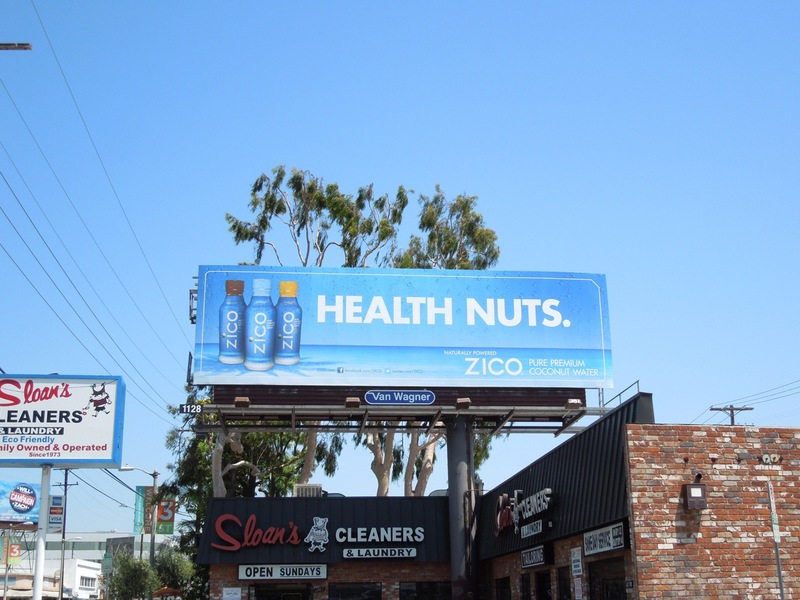 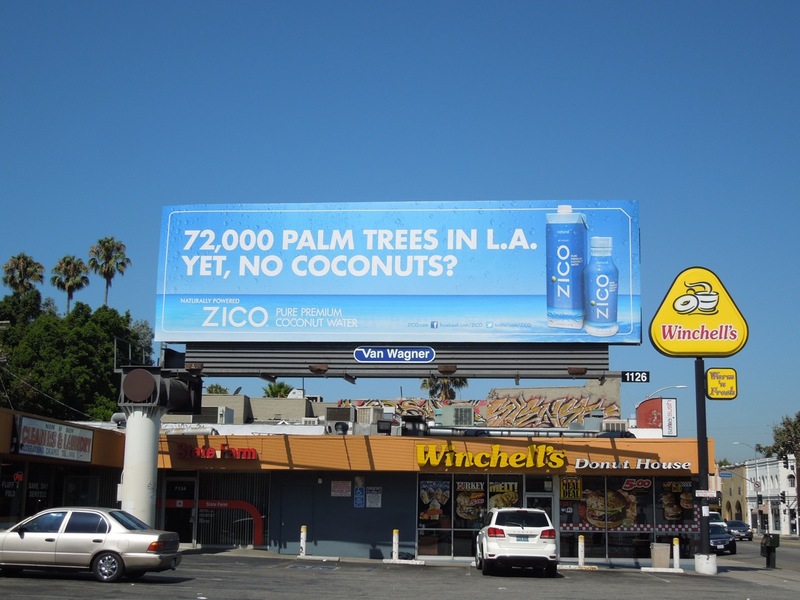 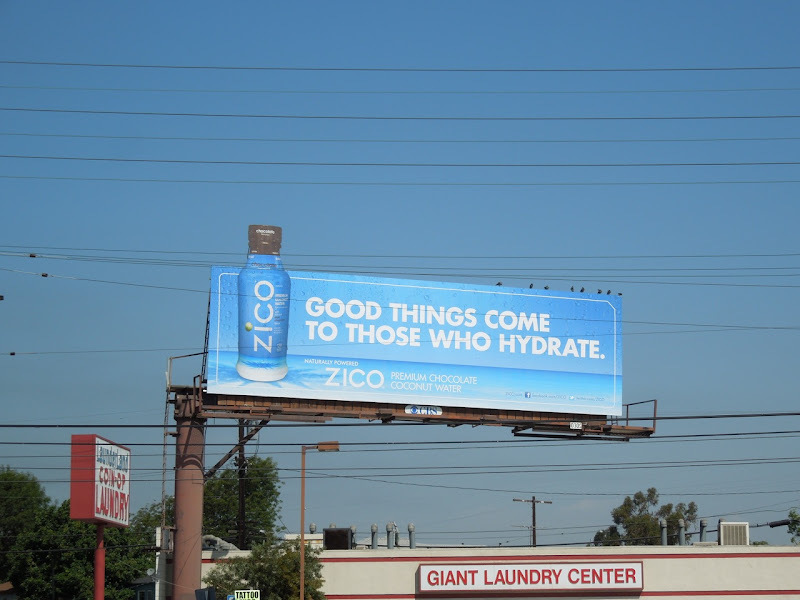 UPDATED: Here's one of the billboards from the follow up 'Oomph' ad campaign that Zico coconut water chose next, although it didn't have the same heavyweight ad spend or prominence in the crowded skies of L.A. 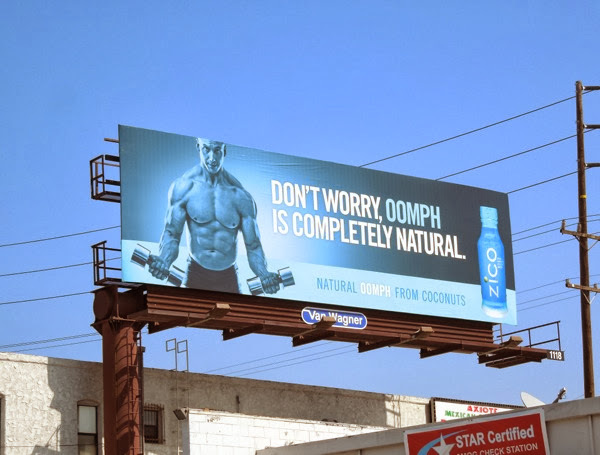 This fun, blue bodybuilder ad creative was snapped along Santa Monica Boulevard in West L.A. on April 21, 2013.